The popularity of luxury vinyl flooring, also known as LVT and LVP, is increasing every day. Due to its durable nature and low price point, more people are choosing this for their homes. Luxury vinyl flooring is both waterproof and stain-proof, making it a great choice for a kitchen or bathroom. One of the best things about vinyl flooring is the ease of installation. It can be done in a short matter of time by anyone, no need to spend money on hiring someone to do the work for you! Prior to installing luxury vinyl, ensure that you have read all manufacturer’s instructions beforehand. It is highly recommended that materials are left in the room in which they will be installed for 48 hours before installing, in order to allow the tile to expand and acclimate to the temperature. Measure the room. Figure out the square footage, and determine how much square footage each carton of vinyl flooring will cover. Use these measurements to determine how many cartons you will need. Gather needed tools: hammer, utility knife or hand saw, a finely notched trowel, the vinyl, and if needed, vinyl adhesive (consider purchasing self-adhesive vinyl for easier installation). If laying new vinyl on top of the old vinyl, ensure that it is smooth and in good condition. If laying it over concrete or other material, fill any cracks or holes and smooth out any bumps. Locate the center point between two opposite walls. Use chalk or a charcoal pencil to draw a line along the length and width of the room, dividing the room into quarters. Begin laying tiles at the center point in the room. Add tiles along each of the reference lines, and continue to move from the center outwards. If using self-adhesive tiles, remove backing and press tiles firmly onto the floor. If not using self-adhesive tiles, spread vinyl adhesive with a notched trowel according to directions on the adhesive packaging. After applying several rows of flooring, use a rolling pin or a floor roller to firmly attach the vinyl to the floor. Use a hand saw or utility knife to cut any pieces of vinyl that will not fit. Continue laying tiles from the center out and then applying adhesive. Once the floor is complete, leave floor untouched for the recommended amount of time as stated on the packaging. Not Sure if Vinyl is Right For You? 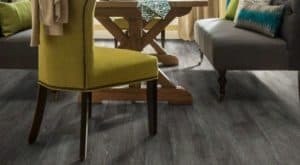 If you would like to learn more about vinyl flooring and how to install it at home, give us a call at Carpet & Tile Mart to speak with one of our knowledgeable flooring specialists! We have professionals who can help you determine which product is best for your specific needs. Our flooring options work for any budget!